If you like deviled eggs, you’ll love Deviled Egg Salad. It’s easy to make, tastes like deviled eggs, and has other uses as well. The first time we made it, we were taking a trip to Washington, D.C.
Due to fool allergies, we always make sure to take along some food in case we have trouble finding food that is safe to eat. We were so glad we took food to D.C. because we could not find restaurants or grocery stores in the area where we stayed. We spent each day doing a lot of walking, and this protein filled breakfast lasted us well. Each morning for breakfast we made a sandwich with Deviled Egg Salad, and then placed a slice of cheese on top of the egg. It was filling as well as nourishing. How to Make Deviled Egg Salad. Chop the egg into small pieces. After you’ve mixed the ingredients, sample it and adjust to your taste. It makes a great appetizer with crackers or as a dip for parties. This is a really easy way to fix and eat eggs, especially when you’re on the go! This looks wonderful! Thank you for sharing with us at Brag About It! I adore deviled eggs! Must try this out. Thanks for sharing. Hmm, We will have some of this by the end of the day! this sounds delicious! I have problems finding food I can eat also. 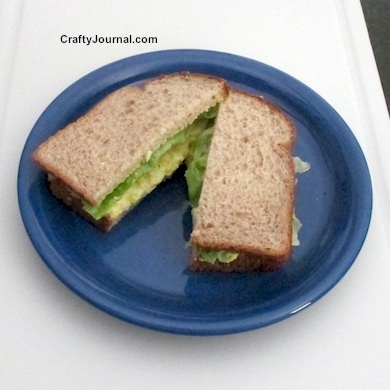 I love egg salad – will definitely be trying your recipe out! Thanks for sharing at the Creative Inspiration party. Thank you for sharing your creative recipe on the Bowdabra Saturday Crafty Showcase. We look forward to you sharing a new projects next week. We love egg salad sandwiches! Especially on a hot summer day. I make it pretty much the same other than I add a tiny bit of chopped pickle or relish and sometimes a tad of onion! Delicious!! Thanks for sharing with SYC. We love egg salad at our house. It’s one of my kids favorite sandwiches to eat. Thanks so much for linking up with Merry Monday this week! Your post was shared via Twitter! What a great simple tutorial! I would chow down on this on crackers!! This is a super summer salad and has been selected as one of the featured posts for the Family Fun Friday linky party. Thank you for sharing! Stop by brittalafont.com (food hostess) on Thursday after 1pm PST to grab your “I was Featured” button! 🙂 Already pinned it! !